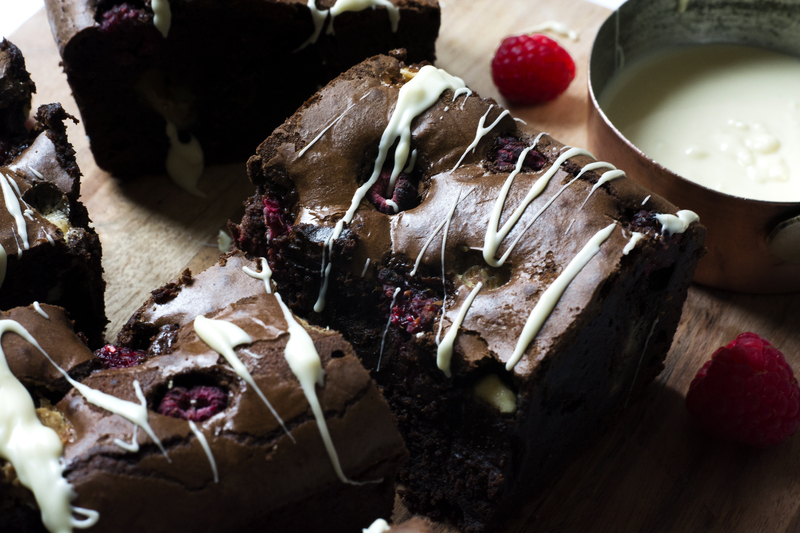 What to do about the raspberries! In my family mid June until the end of July means only one thing … raspberry season. My dad is an avid gardener and he has a huge patch of raspberry bushes at the end of the garden and for as long as I can remember each summer we have had to collectively rack our brains to figure out what to do with all of the fruit. Once we have tired ourselves out making enough jam to last until next year, made a few batches of raspberry vodka and gin and then stuffed every freezer in the family with the yield we generally find ourselves at a loss at how to use them up. 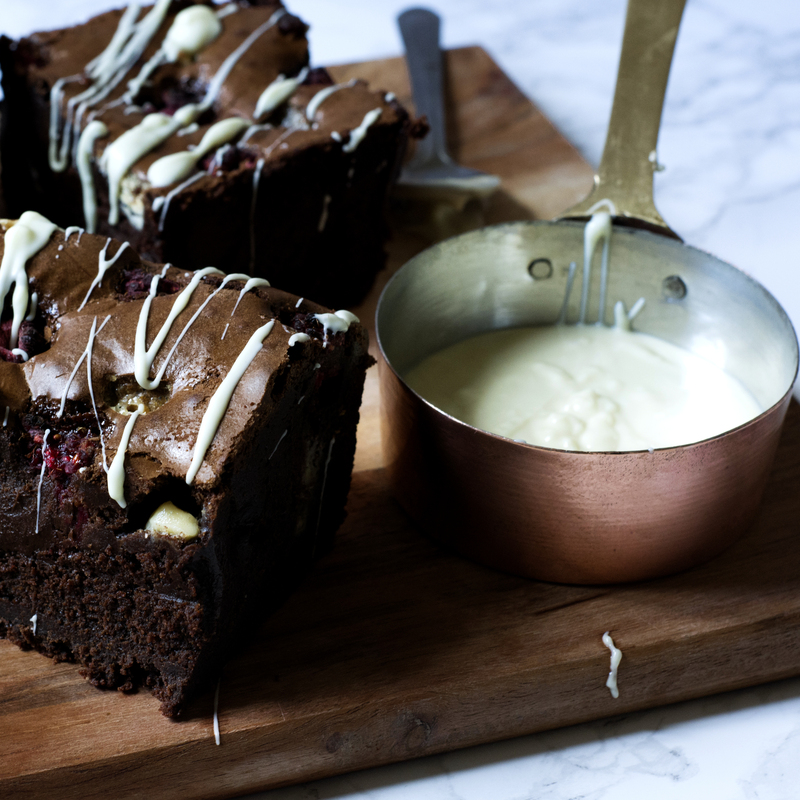 This is when I generally get creative with my recipes and these brownies are this year’s star of the raspberry show. Brownies have always been my baking nemesis, for some reason no matter how thoroughly I follow the instructions they never really come out right, until now. I have finally cracked the perfect brownie recipe. The one recipe that even I cannot f**k up. 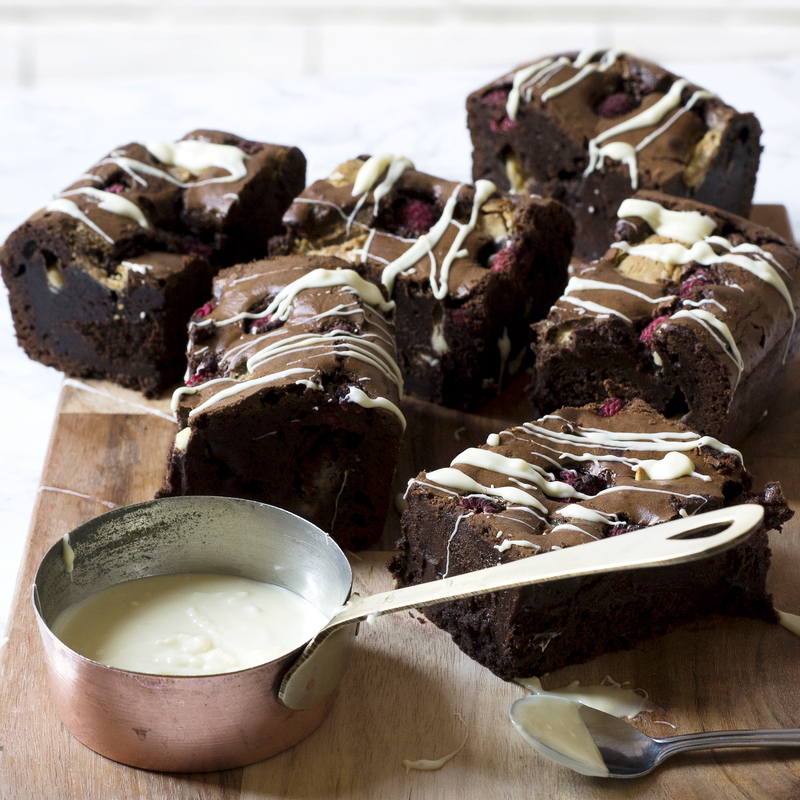 This recipe produces the most deliciously rich chocolate taste, perfect fudgy texture, accented with the creamy white chocolate pieces and the tart yet sweet burst of raspberry. Also beat in the eggs really well. Make sure each egg has fully combined and then some before adding the next egg. Once you add the flour and the cocoa, fold gently, just enough to combine and then stop! Buy decent quality white chocolate. There really isn’t any real chocolate in white chocolate and its prone to just caramelising and going hard if it has too much sugar in. In general I don’t think you have to break the bank when buying chocolate but don’t automatically reach for the cheapest white chocolate, you will always regret it. Preheat your oven to 180C/gas mark 4. Prepare your tin; I used an 8” square pan. Grease the tin and line with baking paper. I find that the best thing for this is cooking spray; it makes your life so much easier. At this point we need to melt the chocolate and I am supposed to tell you to set your chopped dark chocolate in a bowl over a pan of boiling water, stirring occasionally until it melts. But if you are anything like me you’re going to bang it in the microwave anyway. 30 seconds at a time, stirring between each. Keep an eye on it so it doesn’t burn. Jobs a goodun. Using an electric whisk beat the sugar and butter together until the mixture is light and fluffy. Add the eggs one at a time! (I’m serious! Don’t rush this part!) Give each egg a good minute to beat into the mixture. Add the melted chocolate and vanilla extract and fold in with a spatula. Followed by the flour and the cocoa powder, sieve these in and fold until well combined. Try not to over work the mix, fold until it is just combined. Put aside 50g of the white chocolate. Pour half of the mixture into the tin, scatter half of the raspberries and white chocolate (75g) on top. Follow with the other half of the mixture and then the rest of the white chocolate (75g) and raspberries. If using a smaller, deeper tin like me, bake for 40-50 minutes, however if your tin is wider and shallower, 30-40 min would be better. Once ready, leave to cool then slice into squares (or whatever shape you like). My best tip would be to leave them in the tin until cool then remove and slice as you are just going to end up with a big gooey chocolaty mess. Melt the remaining 50g of white chocolate and drizzle on top for that extra instagramable touch. And there you have it. 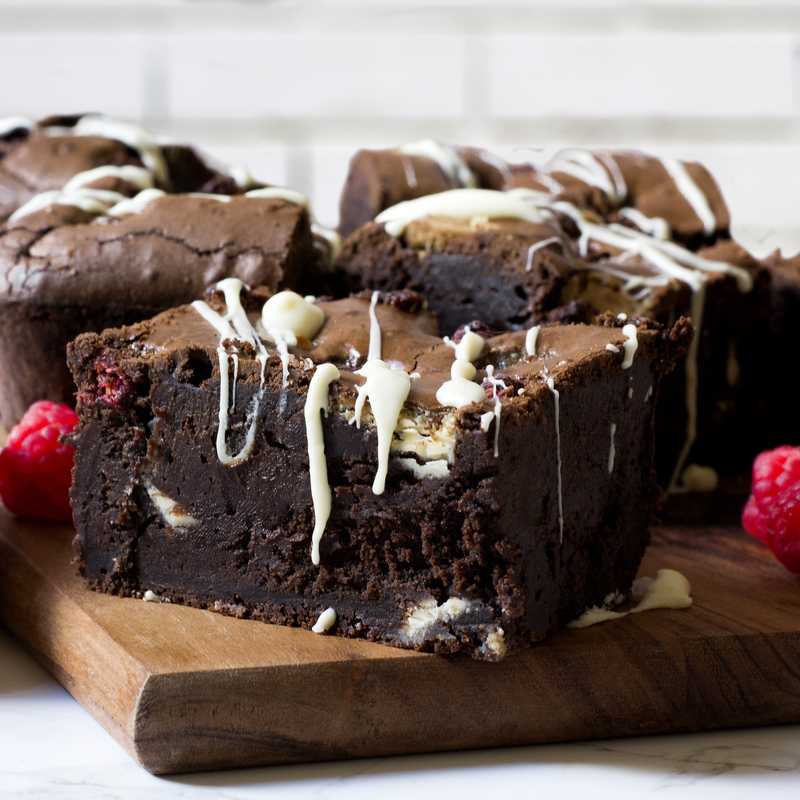 THE only brownie recipe that has EVER worked for me, I have to say this was some years in the making. I have ruined many a tray of brownies before today. Let me know how you get on by tagging @whatseatingmanchester in your social media post. Feeling French? Try this classic Pain Au Raisin recipe.